Japanese Elders-Seek Jail When Financially Insecure or Lonely? [One individual noted in the story] represents a striking trend in Japanese crime. In a remarkably law-abiding society, a rapidly growing proportion of crimes is carried about by over-65s. In 1997 this age group accounted for about one in 20 convictions but 20 years later the figure had grown to more than one in five - a rate that far outstrips the growth of the over-65s as a proportion of the population (though they now make up more than a quarter of the total). 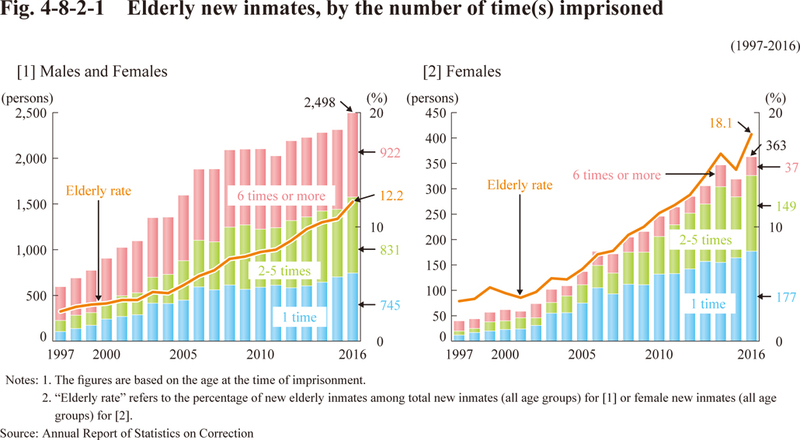 Further, recidivism is an issue with this age group: "2,500 over-65s convicted in 2016, more than a third had more than five previous convictions." The article notes that shoplifting is the most common crime. One researcher "[i]n a paper published in 2016 he calculates that the costs of rent, food and healthcare alone will leave recipients in debt if they have no other income - and that's before they've paid for heating or clothes. In the past it was traditional for children to look after their parents, but in the provinces a lack of economic opportunities has led many younger people to move away, leaving their parents to fend for themselves." The article explains low pensions are part of the issue as well as increasing isolation and loneliness. Thanks to two of our alums for alerting me to this article.